Every day various offices in Manhattan move to a new location or close. As a business man or woman you know how stressful it can be to move or close an entire office, while tending to either your business or the business of closing your office. Once you have moved the office equipment and files to your new space or storage you are still left with cleanout the old office you are leaving. You don't want to leave that old equipment and papers behind because you want to get back the deposit you paid on that office space, but since you have limited time, doing that office cleanout yourself can be difficult to achieve. Here at Flate Rate Junk Removal we can take care of that office cleanout for you. Although you may no longer have any need for those old desks, or outdated computers doesn't mean that someone else may not have some some use for them, so if you have office equipment that is still functioning or can be refurbished that you no longer want we will recycle them and unlike many junk companies we won't charge you extra for recycling that equipment that is still useful. We want to do whatever we can to help the environment and recycling is one way to keep products that are still useful out of those landfills. 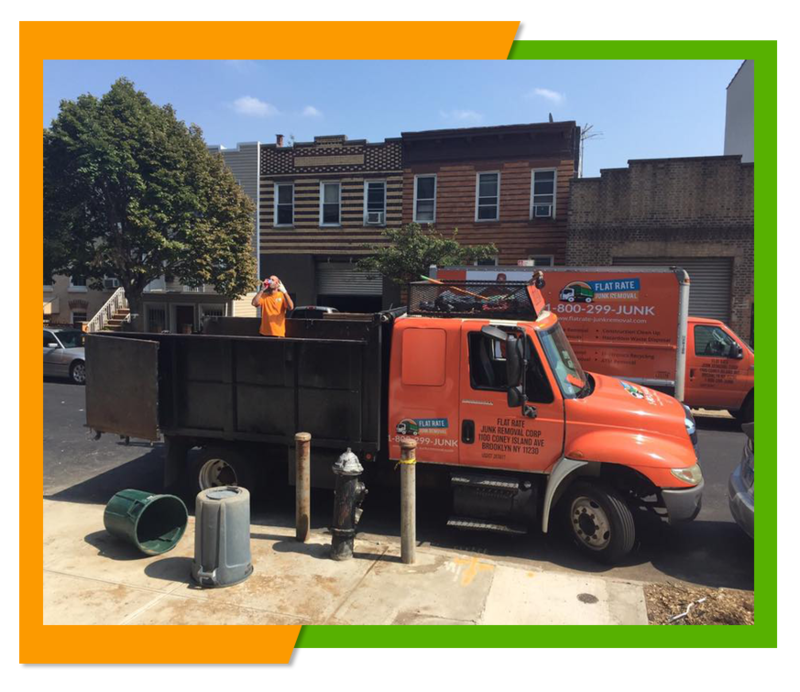 We handle mixed loads so you won't have to hire a separate service for those items that need to be recycled or those that need to be disposed of. Here at Flat Rate Junk Removal we charge a flat rate for our services so you will never be surprised by any unexpected added on charges. You will know right up front what you will be paying for that office cleanout and we will never add on additional charges as we go along. If you want to know in advance how much cleaning out your office will cost we will be more than happy to send someone to your location to look over what you need to have cleaned out and removed and give you a free estimate. If you are want to get a free estimate to have your office cleaned out or to schedule a appointment to have your office cleaned out then give us a call at 1-800-299-5865 and we will more than happy to assist you. 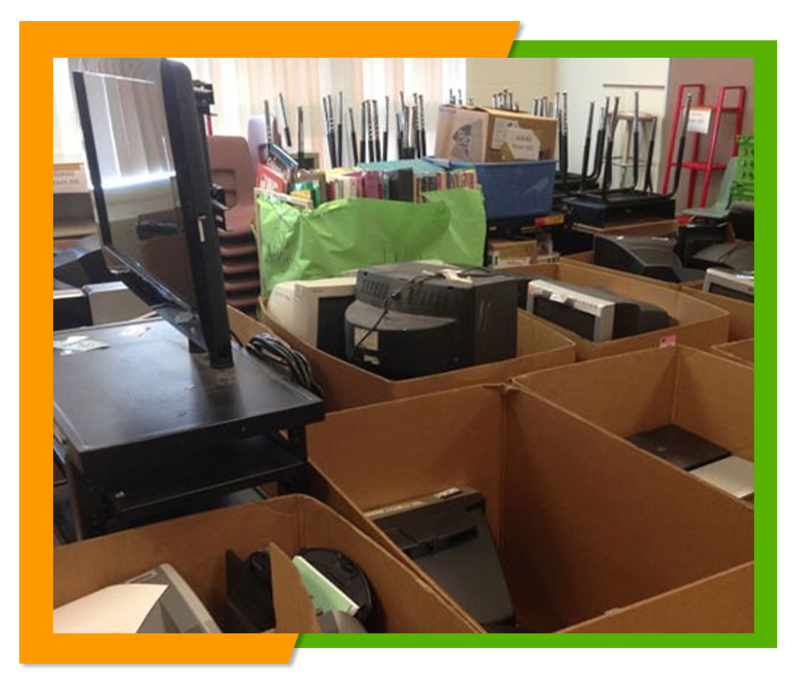 We will remove everything you leave behind from those old desks you no longer want to broken office equipment and waste papers. All you need to do is point to any equipment you no longer want and want to have disposed of. Then we will sweep the entire area clean so it will be ready to occupy by the next renter. Our 24 cubic foot trucks have plenty of room and our 2 man crews have all the right equipment to move any type of office equipment regardless of the size.